Carmelo Anthony stood at the scorer’s table as he waited to check in, surveying the scene. Paul George rifled a skip pass over the top of the Utah Jazz defense into the right corner, and two more quick passes as the defenders converged got the ball back around to the top of the key, in to the hands of Russell Westbrook. 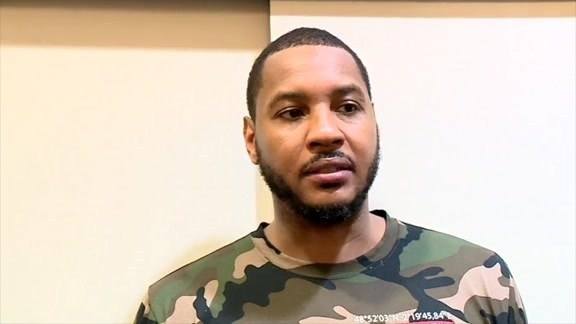 There was a fraction of a second of hesitation, and Anthony instinctively shouted, “one more!” Westbrook snapped into action, zipping a pass to George who was back in the left corner that resulted in an open three-pointer that splashed through the net. "We all hold each other accountable when it comes to that. But, in a good way," Anthony said, explaining the purpose behind his direction from the sideline. "It’s something that we stay on each other about; about keeping it moving and trusting in one another. It was a perfect Thunder offensive possession: four players touched the ball, the action moved to both sides of the floor, and the defense had to rotate. It was one possession in a masterful performance by Head Coach Billy Donovan’s club in its 107-79 victory over the Jazz, an emblematic showing of what the Thunder looks like when it’s firing on all cylinders. The offensive juice that was created for the Thunder was primed by the way it defended, particularly early on when the starting group burst out to a 17-2 lead through the first six minutes of play. The defensive pressure was suffocating, and the shots Utah did get off were tough contested ones. The Thunder managed to get an execution team like the Jazz to get out of their offense and have to play isolation basketball. Five of the Jazz 19 turnovers happened during that opening half quarter, and it helped the Thunder build an 18-point first quarter lead. For the game, the Thunder held Utah to just 35.6 percent shooting and scored 28 points off Jazz giveaways, which were generated off of 15 steals. The recipe for rattlesnake jam starts with defense. The Jazz responded with a 14-6 spurt to start the second quarter, but Westbrook drove the bus on an 11-0 Thunder response run, then proceeded to drive left around a screen and hammer home a one-handed jam to push the lead back out to 19. Utah never got closer than 15 points after that. In a way, this game was defined by some of its dunks. Westbrook’s was a statement that the Thunder wouldn’t be lulled back into a contest in the second quarter. In the third, George went between his legs at the free throw line and broke left of Rodney Hood, then soared over the top of Derrick Favors for a monstrous one-handed slam dunk. “Bout time,” Westbrook cheekily chirped, playfully needling his friend and teammate. That was the inciting incident for a 15-0 Thunder blitz that helped nudge a 16-point halftime lead all the way out to 33 by the later stages of the period. “We needed to approach the third quarter like it was a 0-0 fresh start and we did that,” George noted. Just for good measure, the Thunder reserves added a highlight play early in the fourth to make sure Utah didn’t get any ideas. 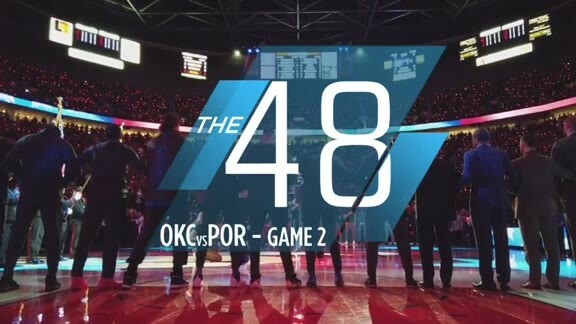 As Patrick Patterson’s three-point attempt came off the front rim, forward Jerami Grant snuck under the rim and thumped an emphatic one-handed put-back dunk to punctuate the night for the Chesapeake Energy Arena crowd. Westbrook continued to find the range on that patented elbow jump shot, and he started the game 6-for-6 from the field. The dynamic that is created simply from that shot dropping makes such a massive difference for the Thunder offense’s scoring output, and the punches it can throw later in the game. Tonight, the Thunder landed all of them. Westbrook found teammates in the flow of the offense, but more importantly, his teammates created shots for one another. Thunder starters not named Westbrook accounted for 10 helpers, and the Thunder as a whole had 9 players with an assist. “Everybody played well. 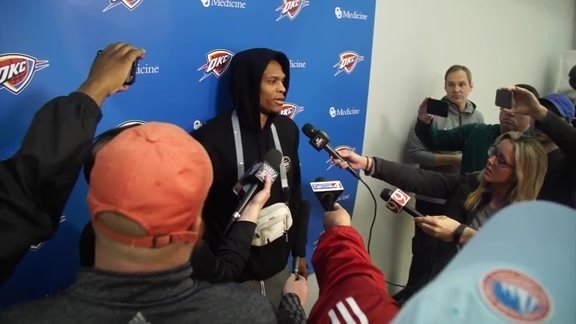 We all did a good job of making the right plays, the right passes and getting the ball moving,” Westbrook said. The biggest beneficiaries were Paul George and Carmelo Anthony, who both clearly had a much better rhythm in this game compared to recent contests. The Thunder’s forward pairing both went 5-for-12 for 18 points respectively, each with two made three-pointers and six made free throws. The Thunder offense knocked down 51.9 percent of its shots, and hit 19-of-22 free throw attempts as it outscored the Jazz by 20 in the paint, proof positive of the type of dominant effort that the team wants to sustain moving forward.